The abdominal region is one that has more organs in our body than any other, therefore, is subject to ache due to a multitude of different causes and diseases. Abdominal pain, popularly called belly pain, is often a challenge to the clinician given the large number of possible differential diagnoses. In this paper we address the main causes of abdominal pain, explaining in simple words trying to distinguish them. 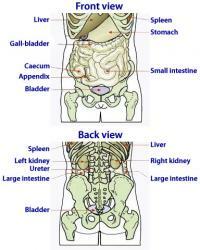 All organs that lie within the abdominal and pelvic cavity are likely to cause pain in the belly. Sometimes organs in the thoracic cavity may also cause abdominal pain. Let's talk about some common causes of pain in the belly, I can not mention all, but I can say that any disease of the organs mentioned above can cause abdominal pain / pelvic. 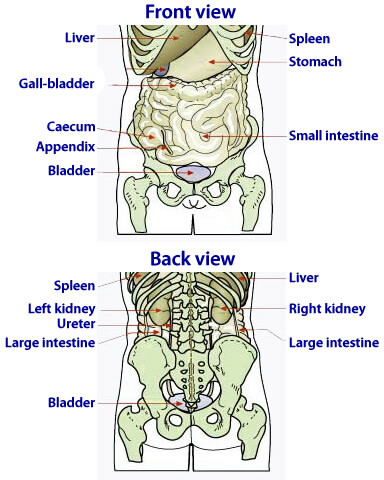 The illustrations below shows the two modes of anatomically division of the abdomen. This division serves to facilitate the description and interpretation of physical examination. Use these illustrations to accompany the explanations of the main causes of abdominal pain that will be given later. 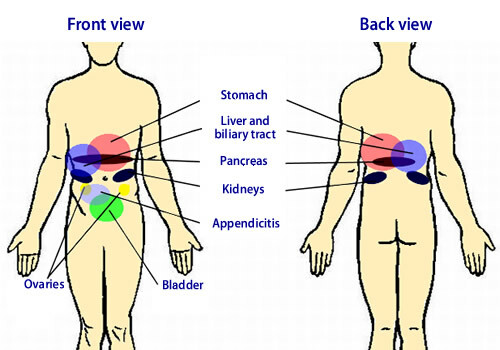 The type of innervation of most abdominal organs causes the brain some difficulty in locating the exact point of pain. Most problems in abdominal / pelvic organs cause pain, which is usually diffuse or around the center of the abdomen. The exceptions are kidney problems, gallbladder, ovaries or appendix, which tend to be more lateralized. In the illustration you can see that most abdominal and pelvic organs eventually have pain in regions located very close to each other. In most cases abdominal pain does not indicate any serious illness. Most cases are associated with intestinal cramps fatty food or food poisoning. The mild abdominal pain, which is short or disappears after a few hours, is usually caused by dilatation of the bowel by gas. Abdominal pain of short duration can also be caused by increase of gas content in the intestines. Abdominal pain is concern when it lasts for several hours, often days, is of great intensity, or disabling associated with vomiting or fever. Let us address briefly the main diseases with pain in the belly. If you want more details about symptoms and treatment of each, click the link provided for each of the texts. Gastritis, a stomach ulcer or duodenal ulcer usually present with similar symptoms: a burning pain in upper abdomen, especially in the epigastrium. This type of pain in the belly is called dyspepsia and usually arises when the stomach is empty. The intensity of pain is highly variable and does not serve to distinguish between ulcer and gastritis. The presence of blood in stools or blood vomiting associated with a picture of dyspepsia usually indicates a bleeding ulcer. Elderly patients with dyspepsia and anemia without apparent cause should also be examined for ulcers. The mere presence of gall stones, called gallstones, usually does not cause symptoms. Abdominal pain occurs when there is an obstruction of the duct draining the gallbladder through one of these stones. If the obstruction is prolonged, there is cholecystitis, inflammation of the gallbladder. The pain of obstruction of the gallbladder is called biliary colic and is usually located in the right hypochondrium and epigastrium, colic is typically one that comes after eating fatty foods. The pain of biliary colic may radiate to the back and right shoulder. The simple biliary colic without cholecystitis usually appears to be stronger in the first two hours after the last meal. When the pain comes with fever and vomiting and does not improve with each passing hour, it is usually an indication of the presence of cholecystitis. Inflammation of the pancreas, called pancreatitis, usually occurs in people who abuse alcohol. Acute pancreatitis usually appears 1-3 days after a picture of large intake of alcohol, presenting a severe pain across the upper abdomen, including both hypochondria and epigastrium. The pain of pancreatitis lasts several days and is usually accompanied by vomiting and becomes worse after eating. Hepatitis is a term used to describe the inflammation of the liver. More common hepatitis are those caused by viruses A, B or C, however, there may be several other causes, including intoxication by alcohol or drug. Hepatitis A usually causes a sharp pain in right hypochondrium poorly defined and is usually associated with the presence of jaundice. Kidney stones usually manifest as an intense pain in the lumbar region unilaterally. It often radiates to the abdomen, especially on the flanks. If the stone blocking the ureter is already near the bladder, the pain may be in the hypogastrium or iliac fossa, radiating to the scrotum. The pain of appendicitis usually starts to grow and is diffuse, especially around the navel, going to find the right lower quadrant of the abdomen only when it becomes more intense. It is often associated with fever and vomiting. A diverticulum is a small pouch that forms the wall of the large intestine (colon), like a glove finger, usually in people over 60 years. Diverticulitis is inflammation of a diverticulum. Most inflamed diverticula that are located in the descending colon, located in the left abdomen. In 70% of cases diverticulitis is a pain in the lower left quadrant of the abdomen and usually occurs in people over 60 years. The pain usually lasts several days and can be accompanied by fever. When there is inflammation of a diverticulum in the ascending part of the large intestine (right), the symptoms are very similar to those of appendicitis. Intestinal infections, whether bacterial or viral, are common causes of abdominal pain. The most common manifestation is abdominal cramping associated with diarrhea. Menstrual cramps occur in the lower abdomen, usually in the midline, but may radiate to the back and thighs. Symptoms such as nausea, sweating, headache, loose stools and dizziness may be associated. The organs of the abdominal cavity are not loose inside the belly, they are surrounded by a well-vascularized and innervated membrane called the peritoneum. Peritonitis, or inflammation of the peritoneum is a serious condition because it means that some abdominal infection / inflammation became extensive enough to affect the peritoneum. As the peritoneum is very innervated, it won't hurt much when ignited, and when much vascularized, facilitates the spread of bacteria from the abdominal region to the rest of the body and can lead to sepsis. Symptoms of peritonitis are a severe diffuse abdominal pain associated with a hardening of the belly caused by involuntary contraction of the abdominal muscles. The patient usually looks sick and there are usually fever and vomiting. A feature of peritonitis is presence of intense pain when we press the belly and then quickly let go. Unlike other causes of abdominal pain, pain is greatest during the pressure with your hands, and no pain in peritonitis when taking hand off quickly than when the stomach is tightening. Peritonitis is a common complication of many diseases such as appendicitis, diverticulitis, stomach or bowel perforation, cholecystitis, etc... and should be treated with surgery to remove the inflamed / infected organ. The presence of infection / inflammation of abdominal peritonitis is called acute abdomen. Pain in Kidney - What are Main Causes?